When it comes to fragrance, I always like to seek out scents which are a little out of the ordinary. Of course I love some popular ones like Marc Jacobs Daisy but I love wearing perfumes which people might not have heard of. Diptyque is a brand which handles scents very well in interesting ways. They always have so many different blends compared to what you might find in department stores. Plus for someone who loves wearing florals and woody scents, it's an absolute dream. Of course with all perfume brands there are a few which aren't to my taste but here's 3 of my absolute favourites. When it comes to scents, I always go for light spring scents with either a hint of white florals or a woody tone. Vetyverio was the first scent I tried from Diptyque when I picked it up in the previous Space NK sale. It's a great daytime scent with a woody notes, vetiver and a hint of fruity freshness. Compared to my other Diptyque scents I'd say this one is the least complicated and it's one which would be great as a gift if you're not too sure what the wearer likes. It is unisex but I'd say with it's natural sweetness about it it's more aimed at women. I wear this one all the time and have used quite a bit but as it's a 100ml bottle it doesn't seem so! I'm a big fan of Diptyque's Baies candle so when I heard that it was available in perfume form, I knew I had to have it. L'Ombre Dans L'eau or "The Shadow in the Water" as it translates to is a very green scent with notes of rose and blackcurrant. As far as scents go, it's a very unique blend of scents and feels as if you're walking through a very fragrant garden. This one's definitely not for everyone as it's such a complicated, strong scent so I'd highly recommend trying it before buying. For the sort of age range, I'd say it's more so an older scent with the amount of rose in it. You know when you've been trying out perfumes for years and you finally find the one? That's what Diptyque's Olene is to me. My favourite all time scent is jasmine and though it does appear in perfumes quite frequently, it's never the main scent. It's just a pure jasmine scent; fresh, floral and light. Remember that Jasmine Tea I tried? It's exactly that. I read a couple of reviews before purchasing and before even trying it, I knew I'd love it. It has top notes of wisteria, middle notes of jasmine and base notes of narcissus but the jasmine definitely takes over. Compared to the other scents I own this is seriously strong stuff, especially for an eau de toilette. Any more than 2-3 sprays and you might start to feel a little lightheaded so at least it will last a long time! The scent does calm down after a while but you do get a sort of oh god what have I done feeling when you first spray it. Highly recommend this if you love white floral scents. As with all perfumes, you really do have to try them on yourself but I hope this gave you all some good info on what to expect from a few of them if you were ever looking for a new scent. I realise they can be pretty expensive so I'd recommend popping into Space NK, giving them all a try and keep an eye out for their next sale as the square bottles always show up during sale time for around half price which is what I paid for mine. Let me know what your signature scent is. Since taking this picture, Olene probably has the same amount of perfume left as Vetyverio, can't get enough of the stuff! I only have one of them, but they last all day! Love these perfumes.. They're such a lovely treat, everything I've tried I've loved! 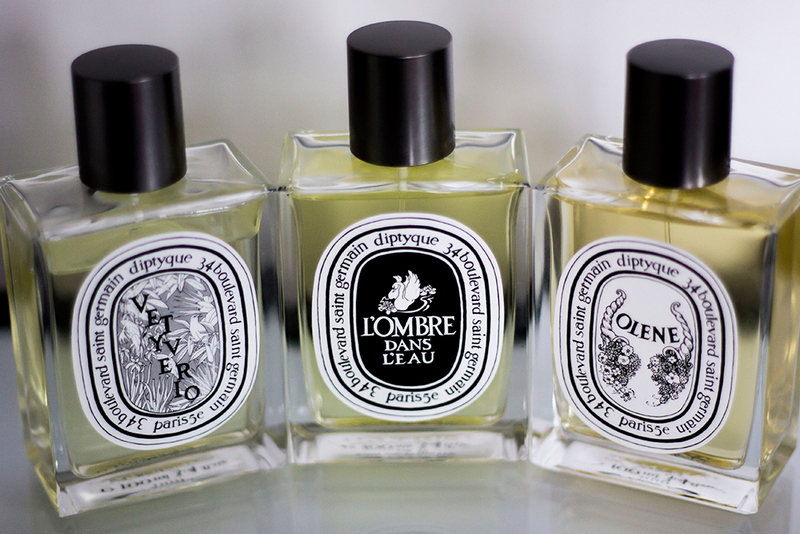 I'm definitely hoping to get my hands on some Diptyque products soon. They're not easily found in Canada but I'm definitely going to purchase something next time I run into this brand. Their candles are lovely too, everytime I wear L'Ombre Dans L'Eau I think I have a candle on because it smells the same as their Baies candle! Too bad Diptyque is not available here! :( I also would love to try their scented candles!